Strictly speaking, neither of the instruments shown on this page are melodicas. Melodica was a trade name of the Hohner company for a series of instruments they brought out in the 1950s which were basically small hand-held breath powered reed organs. Since then, many other companies have brought out their own versions under a variety of different names, such as the Tokai Pianica shown above, the Yamaha Pianica, the Suzuki Melodion, the Samick Melodihorn, the Silvertone Orgamonica, the Tombo Pianohorn, the Zen-On Piany, the Angel Melodyhorn, the Clavietta (shown below), the Bontempi Diamonica and many others. 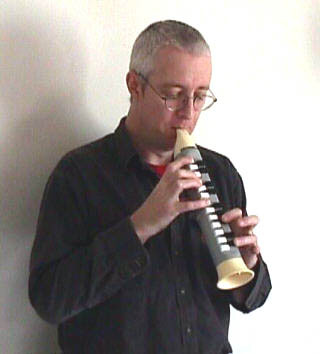 However, the name melodica seems to have become a generic term to describe them all, although they are also commonly called keyboard harmonica. There are two main types of melodica. 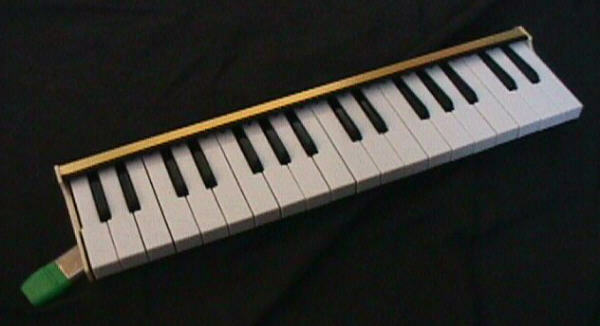 Button instruments such as the Pianica shown above, have a two rows of keys buttons in much the same manner as the Harmonicor or Couesnophone, one row with the notes of the C major scale to be played with the fingers of the right hand, the other with the sharps and flats to be played with the left hand. These are generally considered to be less serious instruments, although the two handed technique does lend itself to playing certain chords that are difficult or impractical on ordinary keyboards.